The Roku Channel is offering a one month free trial for Showtime, Starz and Epix. Its a free trial and auto subscribes at full price after the month expires. This free month offer ends on Sunday 3/31. 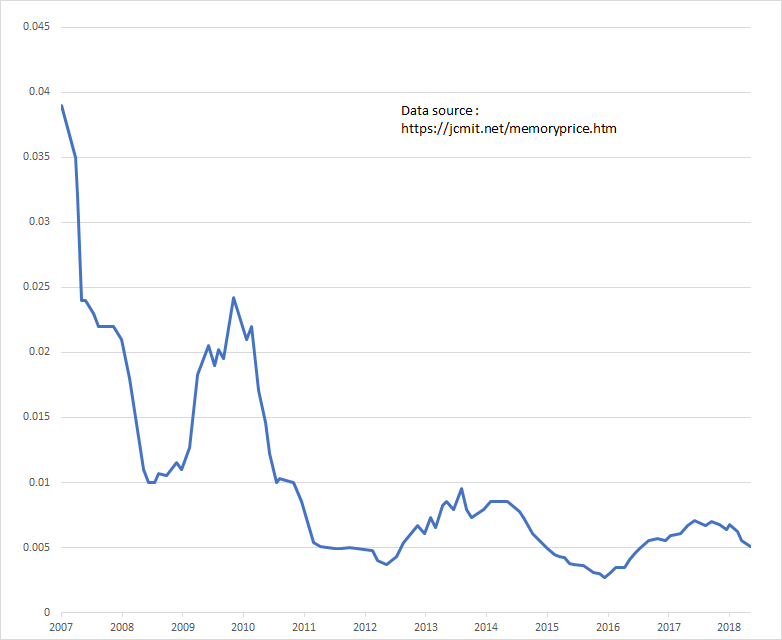 The prices for memory used in desktop computers has been relatively high for the past couple years and is now starting to come down. I was curious what the longer term trend has been. 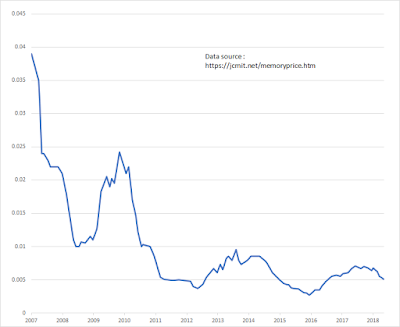 I made a chart showing the prices of computer memory over the period 2007 to 2018. Prices are in $ / MB. I really shouldn't have to tell both of the Prosthodontists in the nation who are currently looking for a job but you probably won't find a job if you drop everything and move to Indiana. Also I don't know what a Prosthodontist is so let me pause and go look that up. Turns out that a prosthodontist is a specialization in dentistry that handles restoration of teeth or dentures. Why am I talking about prosthodontists in Indiana? According to this article "The fastest-growing job in each U.S. state" from Yahoo Finance, the fastest growing job in Indiana is prosthodontist. You can follow that link to see their nice pretty graphic showing the (alleged) fastest growing job per state. Reading that raised a red alert in my BS radar. I figured if I've never even heard of an occupation its probably unlikely that its a new boom job. In fact all I had to do was click on the source cited " projections from the government-backed Projections Managing Partnership (PMP)" to see that there are currently 0 prosthodontists in Indiana and the projection is for there to be 10. I do see that going from nothing to 10 is pretty good growth but 10 jobs is nothing. I don't know how the Yahoo finance articles authors decided that this +10 job growth ranked as the fastest growing job for the state. There are numerous jobs for Indiana projected to have higher net job increases and high % increases. The % increase for prosthodontists is actually listed as 0. The job numbers go from 0 to 10 so theres no valid way to express % increase. Yet for some reason the Yahoo folks decided this change from 0 to 10 was the biggest increase. Two ways of looking at the fastest growing jobs are to look at the % increase or the net increase. A job that goes from 50 to 75 has a 50% increase and a 25 net increase. Clearly there are a LOT lot more jobs in food prep, nursing, personal care, than there are in the "boom" 20% growth jobs such as painters helpers. But if you only look at the % increase then you're likely to chase a job with very few actual openings. Oh, also don't move to Idaho to be an 'exhibit designer'. The Yahoo finance analysis did the exact same thing for that job in that state and decided that going from 0 exhibit designer jobs to 10 jobs is the fastest growing occupation for Idaho. Amazon is running a promotion for 40% off of select channels right now. Its a limited time offer through January 17th. Also looks like its only for new subscribers via Amazon. American Express has a number of offers currently for cash back on several online steaming services. Amex deals are YMMV so check your offers to see if you've go them or not.